Reading Capitalist Realism is an important and timely intervention into the nature of contemporary realism and the ongoing crisis of capitalism. The editors have assembled a powerful collection of essays that interrogate the critical capacity of the term “capitalist realism” to explain both contemporary ideological formations as well as current literary and cultural forms. 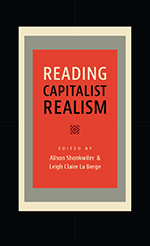 In their theoretical introduction, Alison Shonkwiler and Leigh Claire La Berge convincingly argue that capitalist realism provides more interpretive leverage than competing terms such as postmodernism or neoliberalism. While postmodernism names a period that seems to be decidedly over and neoliberalism fails to capture the “role of representation and belief in producing that which becomes reality,” capitalist realism describes both the intensification of global capitalism’s accumulation strategies as well as their representational logic (5-6, emphasis in original). The concept of capitalist realism thus allows us to conceptually oscillate between the realms of the economic and the cultural by naming the mediation between current technologies of capital accumulation and the production of ideological hegemony. The strength of the phrase lies in its flexibility to describe both an ideology as well as a wide array of cultural modes. The essays in the collection therefore cover a wide range of topics, including contemporary fiction, film and television, key Marxist theoretical concepts such as reification, and our current political situation. The first section of the book, titled “Novelistic Realisms,” contains the most sustained focus on realism as a contemporary literary form. Andrew Hoberek’s chapter “Adultery, Crisis, Contract” conducts an inspired reading of the recent media obsession with adultery and adulterers: rather than simply existing as a mere distraction from “more pressing economic issues,” Hoberek claims that the fascination with adultery is in fact “a displaced register of those issues” (42). The form of the “contract” thus provides the mediatory mechanism between interpersonal violations of marital fidelity and the systemic violations of the capitalist system, transforming new variants of a classic realist genre—the novel of adultery—into a narrative vehicle to represent capitalist crisis (42). Alissa G. Karl’s essay “Things Break Apart” likewise explores the larger allegorical resonances of a narrative trope, arguing that representations of embodiment in the neoliberal novel are a key site of mediation between the individual and the deeply contradictory manifestations of the state and the nation under neoliberalism. Karl focuses on the way in which figurations of the body, especially “ill, injured, and wasting bodies,” function as a representational device for both capitalism’s “violence to individual bodies” and “the deterioration of older tropes of social cohesion including that of the liberal body” (71). Her perceptive readings of novels by James Kelman and Ali Smith reveal how bodies are “permeable and insecure yet also scrutinized” (72) in ways that invoke both larger geopolitical issues and the violence done to individuals who are either “extraneous to or ‘clipped’ to fit capitalist relations” (81). The final essay of this section, Phillip E. Wegner’s “Things as They Were or Are,” periodizes Russell Banks’s 2004 novel The Darling in order to demonstrate how September 11, 2001 brings about the end of the “cultural and political possibilities” of the 1990s, and ushers in “a baleful new sense of capitalist realism” (108). Wegner argues that while Banks’s 1998 historical novel Cloudsplitter gives expression to what the philosopher Alain Badiou names an “event”—or an “improbable impossibility” capable of opening history to radical transformation (103-104)—The Darling demonstrates how the post-9/11 hegemony of capitalist realism not only stifles such potentiality in the present, but also reveals the process by which “its very real presence in the past is occluded as well” (108). Wegner’s essay thus serves as an important reminder of the stakes of both cultural production and theoretical analysis: it is only by remembering that capitalist realism is capable of foreclosing these utopian moments that, as Walter Benjamin put it, we are capable of “fanning the spark of hope in the past” (quoted on 108). One of the strengths of this volume is its expansive reach: by conceptualizing realism as something beyond a mere literary mode, Reading Capitalist Realism can better map the contours of contemporary culture. Indeed, the authors in the “Novelistic Realisms” section also frequently gesture toward genres outside of realism proper: as Hoberek puts it, “it is almost as though the realist novel…must turn to genre fiction to represent forms outside of it” (47). Thus Hoberek discusses The Reluctant Fundamentalist in terms of the “late imperial romance” (47); the descriptions of bodily disintegration in the James Kelman and Ali Smith novels analyzed by Karl cannot help but suggest the horror genre; and Wegner explicitly invokes the science fictional “alternate history” genre when analyzing Cloudsplitter (103). The second section will continue this line of analysis, once again demonstrating that examining forms outside of the realist novel can provide insightful new theorizations about both contemporary realism and the capitalist system. In the first essay of “Genres of Mediation,” Leigh Claire La Berge turns her attention to the fifth and final season of The Wire, revealing that while the season is ostensibly examining the institution of the news media, its real interrogation is “realism itself, and particularly realism in its serial form” (127). Her analysis demonstrates that this season’s major plot strand—a fabricated serial killer that allows the Baltimore police department to obtain funding to investigate drug-related crime—both “kills the series by exposing the structural limits of the realist mode” and “reconstructs the series by rendering visible its own conditions of production, circulation, and reception” (132-133). The Wire then self-referentially demonstrates that “all narrative constructs,” especially capitalist realism itself, are ultimately for sale as commodities, a revelation that La Berge reminds us is also “utopian” in its insistence that there is “no going back,” only “forward into new forms, new genres, and new epistemologies” (134). J.D Connor’s complex portrait of contemporary Hollywood film production deftly juxtaposes textual analysis with production history to demonstrate how films like Déjà-Vu and Source Code “internalize” these production histories and offer us an “allegory of the relationship between the world of [their] stories and the world of [their] production” (161, emphasis in original). Drawing on Deleuze’s Bergson-inspired readings of the relationship between time and money, Connor demonstrates how, in the contemporary cinema of finance capital, “configuration[s] of virtual and actual temporalities” in the film themselves (147) not only “reflect,” but also “think through” their relationship to their own “funding systems” (150). Finally, Caren Irr explores a similar self-allegorization in William T Vollmann’s nonfiction Poor People, which she reads as a “metamodern” text that interrogates the conditions of the prose documentary and its ability to represent the category of “the poor” (180). Irr explains that Vollmann’s ethical standpoint is problematic because it is unable to represent capitalism as a structure and thus forecloses the “site of ‘politics’” (182), making his project the “dialectical antithesis” of scholarly approaches to the poor—most notably that of Jacques Rancière—that reveal “the contradictions underlying a purportedly seamless global capitalist reality” (188). Irr concludes, however, with the powerful suggestion that perhaps Vollmann and Rancière “express essentially the same problem”: the desire for a new collective “culture of communalism” (189-190). It is important that both La Berge and Irr end on utopian notes; indeed, their explorations of forms of realism outside of the novel seem to open a site for the desire (if not yet the realization) of new forms of collective life. The essays in the final section, titled “After and Against Representation,” are likewise engaged in an attempt to open up the apparent closure of capitalist realism as an ideological formation. The first two essays do so by exploring the usefulness of “representation” as an epistemological category. Michael W. Clune responds to interpretations of William Gibson’s Neuromancer as a form of capitalist realism by modeling an anti-realist (or anti-representative) hermeneutic allowing him to read the novel as “an example not of capitalist realism, but of a frankly imaginary capitalism” (201). Clune suggests that what he calls Gibson’s image of “a market without corporations” might provide the left with a powerful figuration of political possibility that is “beyond market realism” (210). Timothy Bewes approaches the question of representation by turning to one of the key terms of Marxist theory, arguing that Lukács’ theory of reification has been misunderstood by many contemporary scholars who treat it as “a representational rather than logical category” (214). Bewes explains that reification does not describe perception or representation; it is rather a “problematic” that explains the “ontological propensities of capitalism itself” (214). Putting it this way allows Bewes to imagine the “possibility of nonreified representation,” which he demonstrates through readings of J.M. Coetzee’s novel Elizabeth Costello as well as recent theoretical concepts like Catherine Malabou’s notion of “plasticity,” both of which escape reification by being both “a representation and a model of representation” (234, emphasis in original). In a brief afterward, Richard Dienst reminds us that “what motivates the exercises and experiments in this volume is not fidelity to reality but rather a commitment to history” (250, emphasis in original)—a proposition perhaps borne out most strikingly in Joshua Clover’s “Communist Realism” and the included conversation between Jodi Dean and Mark Fisher. In the volume’s rousing final essay, Clover reminds us of the truth that has undergirded all of the previous essays: that, as Marx might have put it, the point is not to simply interpret realism, but to change it by abolishing capitalism. Clover’s essay thus offers a critical examination of the term “capitalist realism” itself, suggesting that “we err in associating [capitalist realism] with literature, or with cultural production in general, except as a kind of limit and scourge” (242). Rather, Clover claims, value itself is capitalism’s Real and therefore what must be abolished by an as yet unimaginable communist realism: “communism achieves its realism by doing away with the real of capital” (245). Mark Fisher—whose theorization of “capitalist realism” in his 2009 book of the same name is a key influence for many of this volume’s authors—likewise provides a utopian figuration that seeks to move beyond capitalist realism. For him, “post-capitalism” names “the emergence of something new, something that hasn’t taken shape yet, something that can build on the modernity that capitalism constructs and thwart it at the same time” (38). Finally, Jodi Dean stages an opposition between “capitalist drive”—or the displacement of desire onto the “repetitive circuits” of communicative capitalism—and “communist desire,” which reinstates “the gap necessary for desire” (31-32). It is then “the desire for collectivity” of communism itself that will enable us to overcome capitalist realism (33). In the final analysis, then, the project of theorizing capitalist realism also opens up spaces for new articulations of communist praxis, giving us the ability to imagine a future in which we might see the end of capitalism (rather than simply the end of the world). So not only does this collection productively trouble the boundaries between textual forms and theoretical categories, but it also reminds us that, try as it might, capitalism has not yet completely closed off our historical imaginations. Indeed, all of these essays have attempted, in some way or another, to open horizons beyond the Real of capital. Reading Capitalist Realism is then not only a crucial intervention into the questions of contemporary realism within literary and cultural theory, but also an important intervention into contemporary political and utopian thought. If capitalist realism “denotes the site upon which the limit of the imaginary is constructed” (6), this volume also reminds us of the importance of remaining faithful to what Wegner’s essay calls the event of the “improbable impossibility,” or the radical transformation of our bleak world for the better. Derrick King is a PhD student in English at the University of Florida where he studies contemporary literature and culture. His research interests include Utopian studies, Marxism, queer theory, and science fiction. He has recently published essays on the television series Dollhouse, the 2012 horror film The Cabin in the Woods, and has a forthcoming essay on Utopia and the event in 1990s queer romantic comedies.